Both black and red are bold colors that will provide a modern appearance, while white is mainly used for neutralizing the shrinking effect brought by black and red. So the three colors make a perfect and classical combination for bedroom color ideas. It will bring you dramatic outlooks and various good feelings for you. 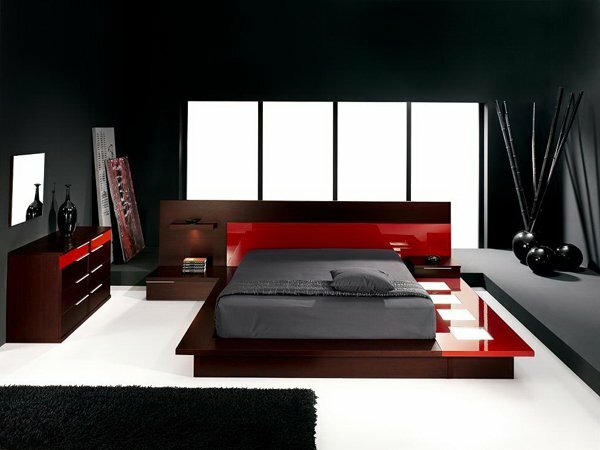 Check out the 15 Pleasant Black, White and Red Bedroom Ideas we have below. Harness the attention-getting power of red and use it to emphasize interesting architecture or other cool elements. This is a great example of how using small bits of the bold hue in a few places throughout a room creates harmony and balance – tricky to do with a color this dominating. Like most chairs in a good permanent collection, it can make its way all around the house. Swap it into your bedroom when you need an occasional chair; you’ll want to admire it, so it should inspire you to keep those clothes put away instead of draped on the chair. 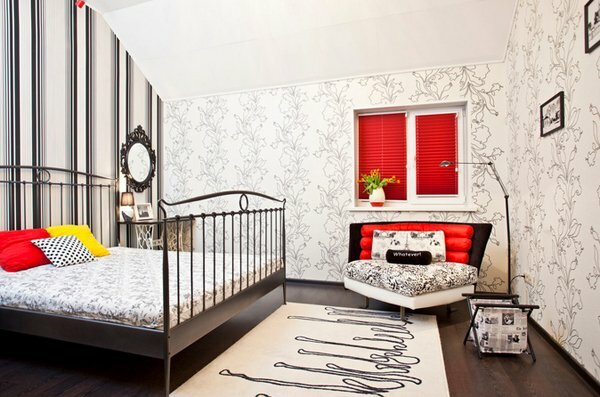 This black, white and red bedroom is a fabulous combination that works every time! This master bedroom is appealing in every way. Won’t you agree? The bed is from Stanley Furniture – it goes well with creating a theme the designer had in mind. The red wall complemented the beddings, the pillows and the pretty much everything in this bedroom. The thought of adding white printed wallpaper matched the red blinds on the window. The play of colors in this bedroom is simple but canny. We love the painting on the wall – note the play of the black and white on it. 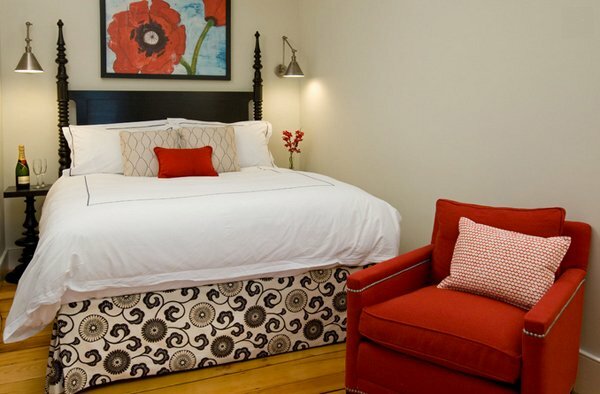 We enjoy the white bed with red accent pillows with a black side table. Simple but eye-catching. 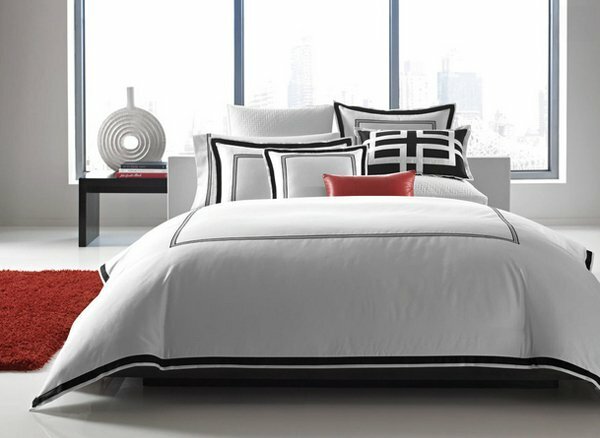 The Hotel Collection Tuxedo Embroidery Collection features an understated landscape with clean lines that give your bed a sophisticated, modern finish. Hot and cool red, being a warm color, is often paired with other warm hues. Shake it up by mixing it with cool neutrals instead, as demonstrated in this modern and elegant bedroom. 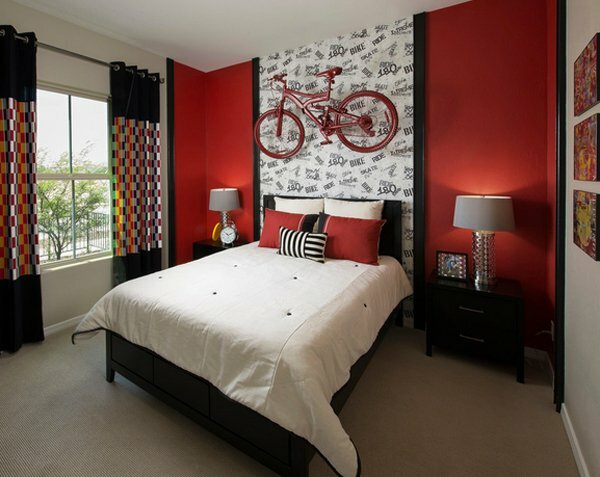 It’s a great way to inject red into your bedroom without making the space too energetic. This is one asymmetrical platform bed. Something like this doubles as slumber-inducing sculpture which is definitely a conversation piece. This New York contemporary bedroom has a comfy bed which is paired with red and white side tables; silvery table lamps and lovely curtains. What’s with faux furs in bedroom? They give texture and drama to any space where we add them into. The red accents on the walls, on the bed, and small tidbits sure are stunning. Note that even the ceiling has reds in it. Invite drama. Hues of bold red and modern charcoal pair for an artistic, sophisticated effect in Hotel Collection’s Frame Lacquer bedding. An architectural block pattern resonates throughout the collection, from the duvet cover to the decorative pillows, giving your room a striking look of luxury. 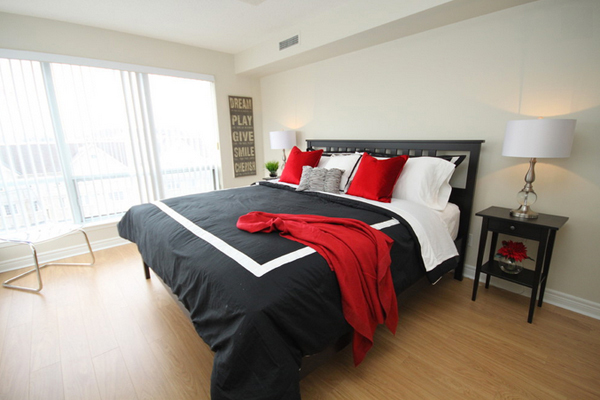 Master bedroom, we carried the color scheme throughout this Condo, incorporating black, white, greys and reds. The view from this bedroom is spectacular! Don’t you just love the aura this bedroom is giving out to you when you look at it? It’s serene, calming and contemporary. We see that the choices of the decors are pretty and unique. 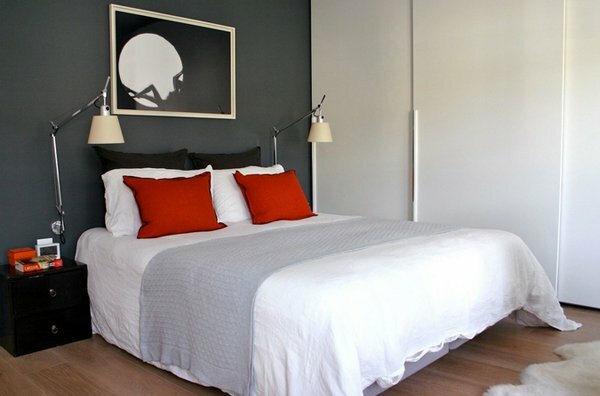 The intensity of a black, white and red bedroom can be neutralized when a fourth color is added. Paint the bedroom walls marigold, or soft butter. This backdrop is quiet and allows your colors to make their statement in furniture, accessories, textiles and flooring. 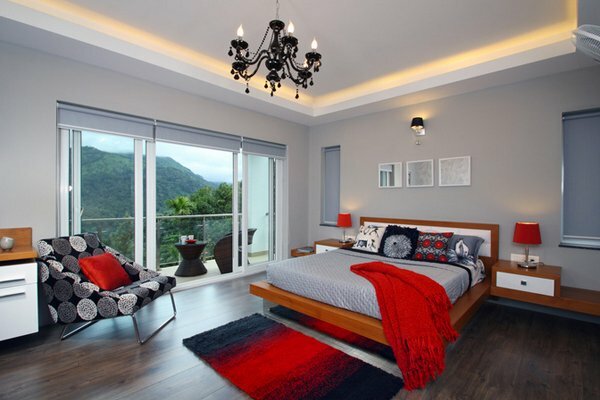 A white bed, black and red bedding, red accents on black side tables and black and red lampshades are all toned down when placed against the neutral walls just like the ones above – 15 Pleasant Black, White and Red Bedroom Ideas. 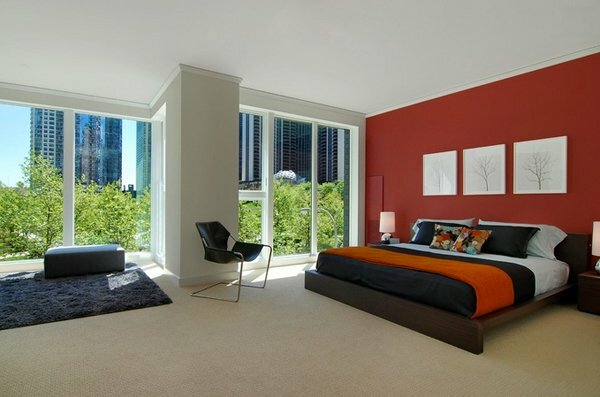 Also check the invigorating red bedroom designs for more photos which showcase the boldest color! Yahh your right they are stunning bedrooms! Red and black are heavy colors for me but because there’s an added white color it becomes more calming and serene. 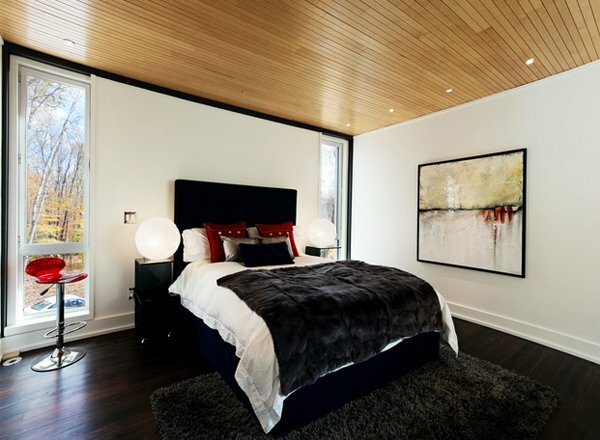 A perfect combination..I love the Modern Platform bed it’s a unique style. The picture of the red bedroom that is titled Cottage Style Model Home; can you tell me the paint colors (the red and cream both) and who the manufactures are? Thank you.